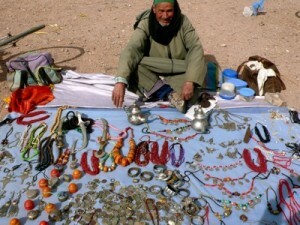 Exploring the Souks of Morocco is a great way to connect with the local people and to experience first hand the tradition of Moroccan buying and selling of a wide range of goods. Moroccan Souks are typically held once a week in each city and region with the “day of the souk” being the best time to purchase fresh vegetables, fruits, preserved lemons, olives, spices, household items, Moroccan jewelry, Music, Toys, Glass ware, Silver, Gold, Clothing, Moroccan carpets and other exciting finds that are carried across the Maghreb from souk to souk. A majority of the goods that are sold at Moroccan souks are either imported or made and sold by local artisans, vendors and Nomads who descend from the Atlas mountain regions to sell their wares. The good s at Moroccan Souks which are primarily imported from abroad are made available to cater to the local population in Morocco who prefer goods that are made of plastic, glass and porcelain as a result of their low price point, quality and attraction to foreign goods. A Souk (souq) is referred to as the commercial quarter in an Arab or Berber city and specifically refers to the weekly market. Historically in Morocco, souks were held outside of cities in the location where a caravan loaded with goods would stop and merchants would display their goods for sale. Souks were typically held when there was a caravan passing through a city or if there was excess of goods available. At that time, souks were more than just a market to buy and sell goods; they were also major festivals and many cultural and social activities took place in them. A result of the expansion and growth of Moroccan cities during the past ten years has created an environment where traditional Moroccan souks have become less important in major cities such as Casablanca, Marrakech, Fes, Essaouira and Tangier. The reason an interest in traditional souks in major cities has declined is because larger, more modern Moroccan places to shop such as Marjane (American “Target” equivalent), Acima, and other urban centers now offer a similar or better quality of goods. 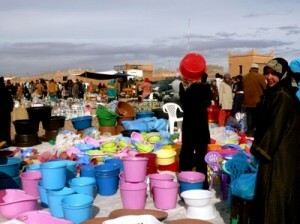 Moroccan Souks in smaller cities, towns and Moroccan villages are still a large weekly tradition and the main source of goods for the local population. Families who live in remote mountain regions of Morocco or in small villages often travel long distances each week to the traditional Moroccan Souks where they can stock up on goods. 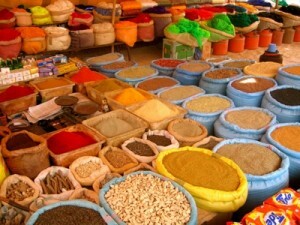 If you are considering a Morocco tour make sure to ask your travel agent to include a visit to the local Moroccan Souk. 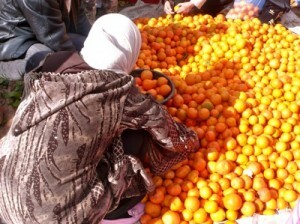 Visiting a Moroccan souk offers an unforgettable visual and sensory experience. 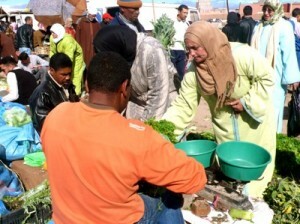 You are currently browsing the archives for the Morocco Souk Shopping category.